It was a busy weekend for San Diego Go Club members as they taught and demonstrated Go Friday and Saturday at the annual Cherry Blossom Festival at the Japanese Friendship Garden and then competed in the 8th annual San Diego Go Championship on Sunday. AGA membership: I realize that there were many problems with the AGA web site for renewing or initiating membership AGA memberships. I am taking the issue up with the AGA President and the AGA Board. The system has not been working correctly since before the last US Go Congress in July 2018. Thanks: To all of those who helped at the Cherry Blossom Festival and who set up and took down all the go equipment at the chess club. 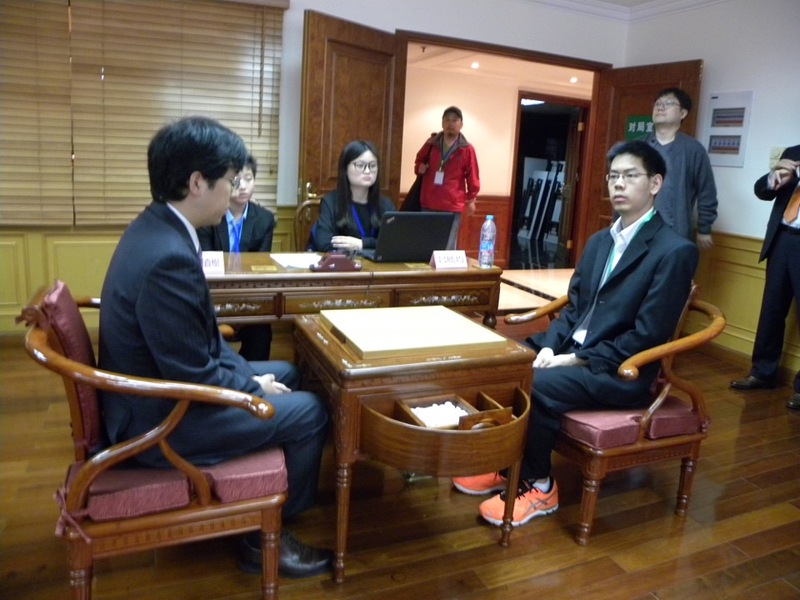 The Open Section ended up with a 4-way tie for First Place: Hongkui Zheng 6.8-Dan (2019 Champ), Xinyu Liu 6.0D, Yi Wang 6.8D (2018 Champ), Mark Lee 9.9D (2016 Champ). While all four players shared the combined 1st-3rd place prizes totaling $600, Hongkui Zheng was declared the champion based on the GoClubs.org tie-breaking system. Congratulations! It is GREAT to see the younger players moving up the rating scale. 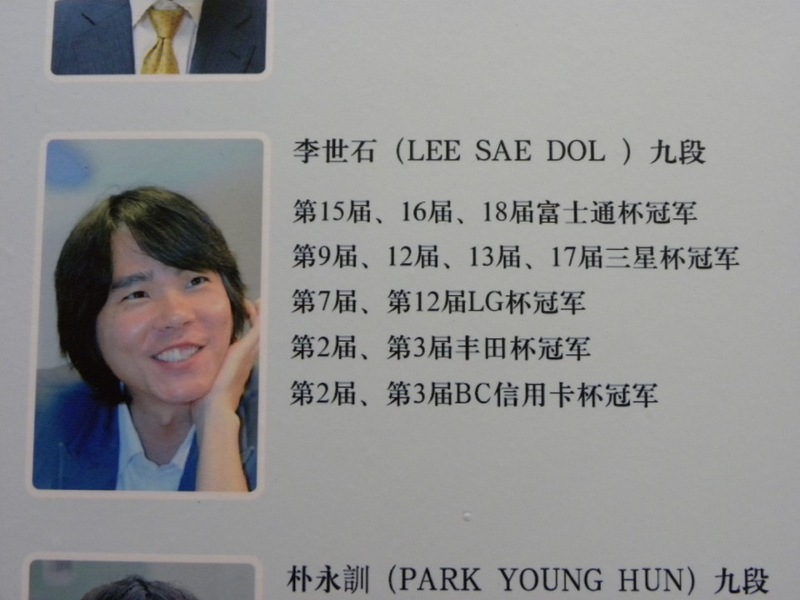 By next year, you may be playing one of Hai Li's young students as they graduate from 13x13 to 19x19. A BIG thank you to the San Diego Chess Club for letting us use the exceptional chess club facilities for our gatherings. 2019 US Go Congress: Madison, Wisconsin, July 13-21. The fall gathering at my home if anyone who would like to play or watch go is scheduled for noon-5 p.m. on Sunday, October 9. One special guest for this soiree is the executive director of the Confucius Institute of San Diego State University. She is also bringing a couple of go players with her. Last week, Les and I met with Hai Li, a Chinese 5P player who runs a go school in China. He is planning on bringing 20-30 of his students (ages 7-12) with parents to the 2017 Go Congress here in San Diego. One of his former students and son will be at the soiree. stones that are not kept at the club. Attendees can peruse the 200+ book go library and borrow (or return) books. UCSD, SDSU, UCLA and even L.A.
After pizza, there will be a short meeting of those who are interested in volunteering to help at the 2017 US Go Congress. All players from 8-dan and pros as well as beginners are welcome. And everything is FREE. Come for the whole afternoon or just a part. As usual, free rides are offered to any UCSD student who needs one to come to the soiree. The San Diego Go Club will be hosting the this event August 5-12, 2017.. This is an all volunteer happening (except for the professional go players flying in from Japan, China, Korea and Europe to teach and analyze games), so we will need lots of help. Les Lanphear and I will be the co-directors of the Congress. The Town and Country Resort is centrally located in San Diego in Mission Valley, near the intersection of Interstate 8 and 5. When registration begins (not for a while) people will be able to choose between the newly remodeled tower rooms or the the less expensive garden rooms. All rooms are virtually right next to the ballroom, where the US Go Open will be played, and the classroom space, where the pros will give lectures.s stop next to the hotel, which runs to Balboa Park and the zoo. Just beyond the trolley station is Fashion Valley Mall with its upscale stores and food court. live KGS commentary on top board games, masseuses to massage players during their games, free food truck lunches to all those who pre-register on both Saturday and Sunday of the tournament, and a demonstration game between Yilun Yang 7p and another top pro player. And, as always, everyone who pre-registers and plays in all 5 of their matches has their full entry fee refunded. This tournament is not to be missed! later in the year. Help Kevin Chao have the best club. a workshop on teaching go in schools. Thank you Nihon Ki-in. I will be unreachable by phone from October 11-25. Send me an email. American Go Association president Andy Okun came to San Diego yesterday and signed the contract with the Town and Country Resort for the 2017 U.S Go Congress to be here August 5-12, 2017. The 2016 Congress was held in Boston in August with 650 registering. The San Diego Go Club will be hosting the event. This is an all volunteer happening (except for the professional go players flying in from Japan, China, Korea and Europe to teach and analyze games), so we will need lots of help. Les Lanphear and I will be the co-directors of the Congress. The Town and Country Resort is centrally located in San Diego in Mission Valley, near the intersection of Interstate 8 and 5. When registration begins (not for a while) people will be able to choose between the newly remodeled tower rooms or the the less expensive garden rooms. All rooms are virtually right next to the ballroom, where the US Go Open will be played, and the classroom space, where the pros will give lectures. T&C has a trolley stop on site which runs through downtown all the way to Mexico. There is also a public bus stop next to the hotel, which runs to Balboa Park and the zoo. The fall gathering at my home of anyone who would like to play or watch go is scheduled for noon-5 p.m. on Sunday, October 5.
their full entry fee refunded. This tournament is not to be missed! the San Diego Go Club at Twigg's. Stop by to play him or watch someone else take him on. where go instruction would be appreciated, contact me. Go continues on Tuesday evenings at Twiggs for the club. an email out when the students return late in September. for the 2017 US Go Congress... so organizational things are on hold until then. in Mission Valley and Montana State University in Bozeman, Montana (don't ask). The fall gathering at my home of anyone who would like to play or watch go is tentatively scheduled for noon-5 p.m.
have shown up in the past from the club, UCSD, SDSU, UCLA and even L.A.
a massage and the return of the entry fee if you play all rounds. The library is open for lending during the Go Soiree. American Go Association president, Andy Okun, announced in his opening remarks at the Boston US Go Congress this week that the 2017 Congress would be in San Diego August 5-12 probably at the Town and Country Hotel. I have accepted the role of Congress Director. The Go Congress is a week of games, e.g. the US Open, as well as lectures, game analysis, simultaneous exhibitions and classes by visiting professional go players... from 9 a.m. into the night. This year, the creators of the AlphaGo computer program which beat Lee Sedol, gave the keynote address. Putting together a go congress will almost be a full-time job for me for the next year. Hopefully, I will be able to draw from all of the southern California go clubs for volunteers. Jobs are as varied as can be from handing out T-shirts at Saturday registration to the major ones of Treasurer, Registrar, Volunteer Coordinator, Merchandising,Translation, .... Major jobs usually bring compensation in the form of room and board and registration costs. FIRST THING: The 2016 Boston Congress will be shipping out all of the boards, stones, clocks, and various site necessities as soon as the Conference is over. It will probably take at least a week for the truck to make it across the USA. It would be very helpful to have a couple of strong people to unload the truck and get the gear into the rented storage unit which is around Balboa and Mission Bay Drive. There will be lots of dollies to roll the stuff in. Please volunteer to help. I will be informing you as more details become known. This is your chance to make a contribution to the furthering of go in the US. People will be coming to San Diego from around the world. Please contact Ted at... ted.terpstra [at] gmail [dot] com . Registration is now open for the 2016 Southern California Pair Go Championship which will be held at my home in San Diego on Saturday, May 21 starting at 9:00 a.m. Registration, a map and other information is available at goclubs.org. Pair Go was invented in Japan and features a man and a woman pair playing against another pair. Partners are not allowed to consult with each other as teams alternate moves (black woman, white woman, black man, white man.... etc.). Note: During registration on can declare a team name or join an existing team if you are a second player registering. There is a prize pool of $500 divided between an open and handicap section depending on number in each. There is no entry fee or charge for pizza for lunch and drinks during the day. But please register so I know how many boards and sets of stones to have and how many pizzas and drinks to have ready. The Japan Pair Go Association is sending some books to be given to the players and the President of the American Go Association will be in attendance. If you are female and do not have a partner, there are several male players looking to pair up for the tournament. Send me an email. The AGA is now considering siting the 2017 Go Congress in Santa Barbara or San Francisco. San Diego is just too expensive in August. I may end up co-Director. Li Hai 5p, a pro and noted teacher from Tianjin, China, will visit the Santa Monica Go Club on Saturday from 11 a.m. to 1 p.m. to teach, with the right turnout, do a simul perhaps. Li runs the Jin Hai Go Institute and counts among the people he has taught the champion Shi Yue 9p. Please contact Joe Cepiel at joseph.cepiel@mail.com for more details. The design committee of the Santa Monica Coffee Cup has finally chosen this year’s theme color, along with the colors for the next two years after. The “Coffee Cup” to be awarded to the first place winners in each division, as well as the tiles awarded the placers, will be painted fulvous, a kind of dark yellow with some brown in it, said tournament organizer and AGA president Andrew Okun. “There were good arguments for mikado and sarcoline, but fulvous won the day.” The 2017 theme color will be something between glaucous and nattier blue, followed by sang-de-boeuf in 2018. Oh, and the 10th Annual Santa Monica Coffee Cup itself, colors aside, will be June 11. It will be a three-round AGA-rated go tournament held, courtesy of owner Pam Stollings, at the UnUrban Coffeehouse, 3301 Pico Blvd., Santa Monica, CA. Check in starting at 9 a.m., rounds at 10 a.m., 1 p.m. and 3 p.m., prize giving around 5:30 p.m. Help gratefully accepted in both setting up and clearing up. Preregistration is essential as the field must be held to 64 players at most. Please register immediately at https://www.regonline.com/10thsantamonicacoffeecup. The 2017 and 2018 tournaments have not had their dates fixed yet, but the organizers will seek to hold them on the usual weekend in the middle of June. Please contact Okun at andy@okun.name if you know whether or not “mikado” should be capitalized in the sentence above. 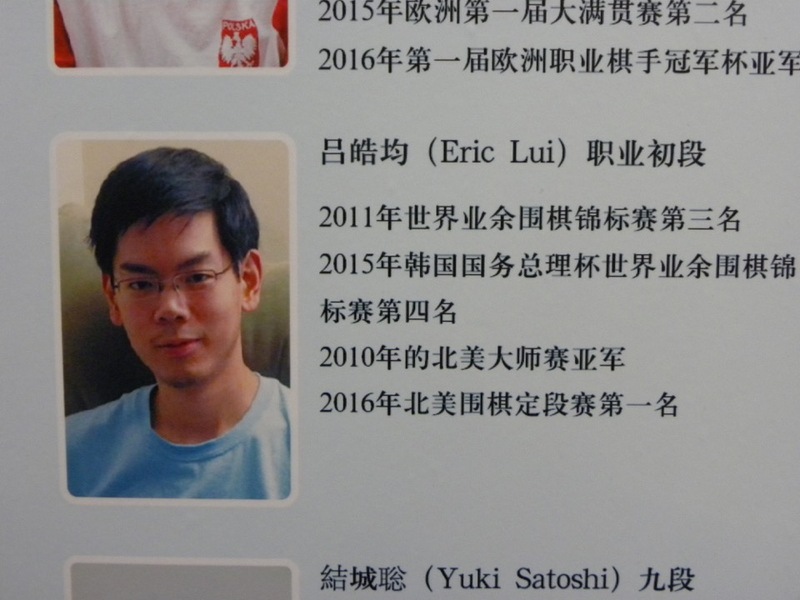 Ted got back from Shanghai and the 8th Ing Pro Cup featuring Americans Eric Lui (versus Hane Naomi) and Andy Liu (versus Lee Sedol). Awesome being with 30 of the best go players in the world! I have been invited to represent the AGA at the 8th Ing Pro Cup in Shanghai, China from Sunday, April 17 to Sunday, April 24, 2016. 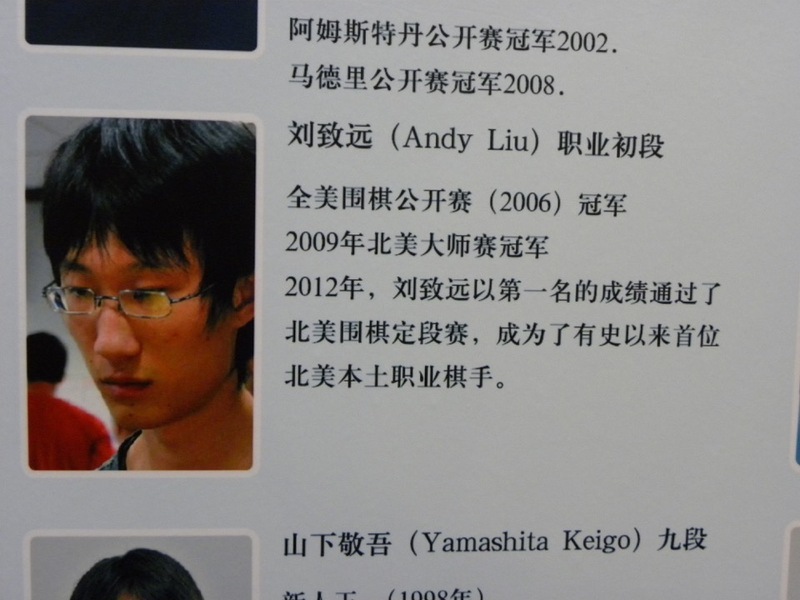 North America has two pros playing in this prestigious event: Andy Lui 1p and Eric Liu 1p. So my Tuesday and Wednesday classes are cancelled next week. Also, Third Sunday go at the Chinese Bookstore is off for April. His other videos explain/teach the various tactical and strategic developments following from the rules. Male/female partners play as a team, alternating moves but not commenting to the partner. This will take place at my home. $500 in prizes. Details when I get back. Tuesday: After-school Go Classes at Clairemont Public Library 2-3:30 p.m.
Tuesday: SDGC Gathering at Twigg's Coffee House on Park Blvd 7-11 p.m.
Wednesday: After-school go class at the Japanese Friendship Garden in Balboa Park 3-5 p.m.
Friday: UCSD Go Club meeting at Price Center. 6-9 p.m.
1) 3/20: Third Sunday of the Month Go at Chinese Bookstore 2-5 p.m. The bookstore has a small deli featuring a $2 bottomless cup of tea and tasty treats. If the AGA broadcasts on the AGA YouTube channel the five-game match between the best go player in the world and the computer that for the first time beat a go professional, I will throw a party to watch game 3 on Friday, March 11 at 8 p.m. The AGA will provide $100 for pizza for the party. If you are interested in attending, send to me an email and I will keep you posted. I will be manning a booth at the annual Cherry Blossom Festival at Balboa Park this Saturday and Sunday from 10 a.m. - 4 p.m. If you volunteer to teach go for a couple of hours or play a demonstration game, the Garden will let you in for free (enter by back gate) and give you lunch. Send me an email if you would like to participate. Tygem or any countries or Go servers. All games will be played even. No Handicap. Komi is 7.5 points. $3000 total cash award, $700 award to open section winner. subject to space availability (note: Space is limited). You will get email confirmation from the tournament director. Registration fee is due on the tournament day when sign up. Parking and hotel information will be provided once registered. The date has been set for this male/female pair go event. Partners alternate moves for their team without consultation. The AGA is throwing in a $500 prize pool. Free entry. More details will be forthcoming... start looking for a partner. Open to AGA members. A team's rating will be the average of the two players. 1) 2016 Winter Go Soiree this Sunday, February 21 Noon-5 p.m. This is the club's quarterly go event at my home that has drawn 30-40 players in the recent past.... from beginners to 7P pros. Everyone, including spectators, is invited. While AGA self-paired games can be played, AGA membership is not necessary to just play a pick-up game or get a lesson. The club gets to show off its expensive thick kaya boards and slate and shell stones, as well as allows people to peruse and borrow from the 200+ books and magazines in the go library. Drop in any time from noon to 5 p.m. at which time pizza will be served to those who want to hang around and socialize. for this FREE (sponsored by my wife's State Farm Insurance agency) event so I know how many boards, stones and pizzas to to have ready. Drink preferences and directions are available there also. FREE rides for UCSD students are available. 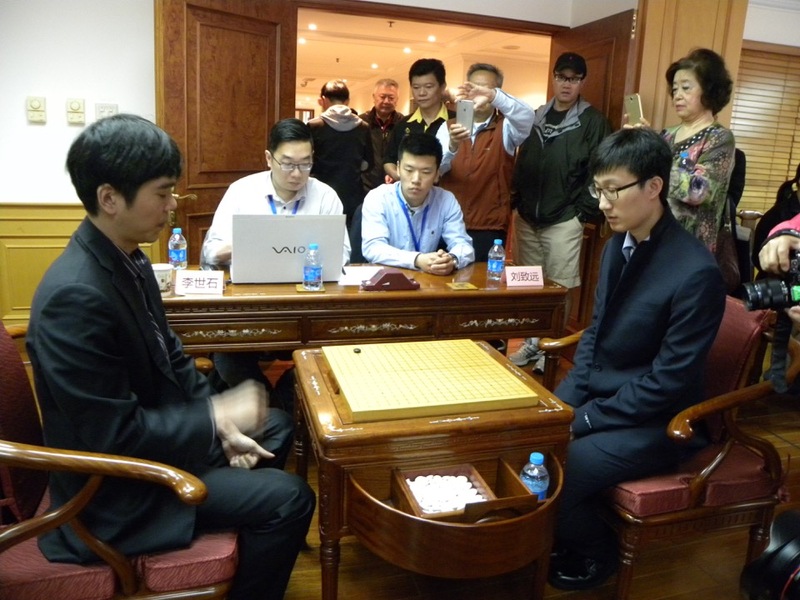 Pair go games will be encouraged in preparation for the May tournament. This is the second largest annual go tournament in southern California with lots of players of all ranks and lots of prizes. This year, I will not be going as I had already made a commitment to teach go at the Cherry Blossom Festival (See 3), but the club has been well represented for several years. The tournament is in Anaheim this year... an hour closer than previous years. Event will be held in Ramada Plaza Hotel Anaheim, one block from Disneyland. Email us to get more event info. The date for 2016 So Cal Open has been set to 3/5 - 3/6 at Anaheim California. Registration info is attached. Hope to see all you in the tournament. The San Diego Go Club will again be teaching and demonstrating go at the 11th annual Cherry Blossom Festival at the Japanese Friendship Garden in Balboa Park from 10 a.m. to 4 p.m. on that Saturday and Sunday. Volunteers are needed to help teach. The Korean Go Club in LA (on Olympic Blvd) sponsored an invitation go event on Sunday.... 11 AGA players versus Korean club members. The AGA barely won a majority of the games during the two rounds. A lecture was given by a 9P professional from Korea which was followed by simultaneous exhibitions by him and Mark Lee (10-dan winner of the 2016 San Diego Go Championship). A hosted Korean dinner followed. The Korean club said that it would sponsor an event every two month. News will be posted here in April. A pair go tournament will be held here in San Diego in May. Time to find a partner of the opposite gender. There will at least $500 in prizes.